Recipes | RAINBOW CHARTERS, Inc. If you’re in or around a dockside restaurant on the North Fork, you may overhear a phrase I’ve heard many times before, “Some call it sushi, but we call it bait”. Often the culprit is a group of local fishermen reflecting on the local lifestyle and laughing at the fancy fish dishes adorning white plates. 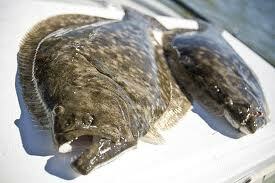 Well, I will be the first to admit it… I eat bait! I eat it raw, I steam it, sauté it, I poach it, bake it, and I grill it. I make it look pretty and I eat it! And I like it! Having said that, I should mention that I am Bob Rocchetta’s daughter and if I didn’t “live fish” I’d probably be committing some carnal sin against the fishing gods. But regardless of that minor fact, I do love it and I especially love it when it has just been plucked from the salty sea. Enjoying the fresh catch after an exciting day of fishing is unlike anything else. It’s a time to savor your accomplishment, to reflect on a memorable day and to share the fruits of your labor with others. As you may suspect, my family and I have enjoyed many moments like this. I have, as a result, developed a bit of a repertoire of fish recipes. It’s my intention to share those recipes with you in the hopes that you too will experience the fulfillment that we have after a bountiful day of fishing on The Rainbow. In the meantime, prepare the salsa. In a large bowl, combine all ingredients and add a fine pinch of salt to taste. Set aside. When grill is to temperature, brush fish filets with olive oil and season with salt and pepper. Liberally brush grill with olive oil so as to prevent fish from sticking. alternatively, use a fish basket. Grill fish approximately 8 minutes on each side, or until opaque and flaking with a fork. Serve grilled bass with mango salsa atop. Recommended side dishes include fluffy jasmine or plain white rice and steamed sugar snap peas. 1. Combine flour, salt and pepper in a dish or shallow bowl. Dredge filets in mixture on all sides, shake off excess and set aside. 2. Over medium high heat, place the butter and oil in a large sauté pan (preferably nonstick). When the butter begins to bubble, place the filets in the pan. Cook until golden, about 3 to 4 minutes on each side. 3. Transfer filets to a serving platter. 4. Turn off the heat and place the almonds, parsley, lemon zest and lemon juice into the pan with the butter and oil. Let cook for a few seconds and spoon over the filets. We like to serve this fish dish with rice and French green beans. 4 pieces of parchment paper, about the size of a standard piece of paper (8” x 11”). 1. Place each piece of paper next to the other. 2. Add the fish first, in the center of each piece of parchment. Brush the top of the fish with a thin coat of olive oil and season with salt & pepper. 3. Place the leeks, tomatoes and basil over the bass dividing amounts evenly over each piece of fish. 4. Start to fold up the edges of the parchment around the fish and pour in a splash of white wine (about 2 tablespoons for each). 5. Fold the parchment over the fish. First, take the top piece and fold it over the fish. Then fold the bottom piece over the top piece. Then fold each of the side pieces under the fish. Try not to loose any of the liquid inside. 6. Cook on a sheet pan for 15 minutes or until the fish is opaque and flaky. Serve in the “bag” or remove. If you do not want to use parchment, this dish can also be done in a roasting pan or baking dish, covered with foil. 1. Place the potatoes in a roasting pan, season with 1/4 teaspoon salt & a few turns of pepper and toss with 1 tablespoon of oil. Roast for approximately 30 minutes or until the potatoes are starting to brown. 2. Then add the leeks, 1 tablespoon oil and 1/4 teaspoon of salt. Continue to roast until potatoes are brown and tender and leeks are soft (approximately 30 minutes more). 3. Meanwhile, fry the bacon until golden and crispy. Slice into 1/2 inch pieces and set aside. 4. When the potatoes and leeks are done, brush a thin coat of olive oil over the fish and season with salt & pepper. 5. Toss the bacon in with the potatoes and leeks and place the fish on top. 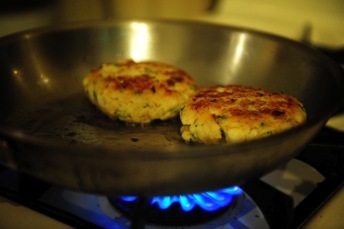 Place back in the oven and cook until fish is opaque and flaky (approximately 10 minutes). 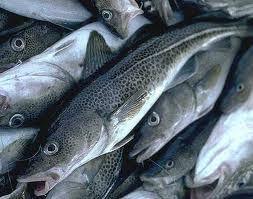 Place cod in baking dish, rub with 1 tbsp. olive oil. Roast fish until cooked through, 15-20 minutes. Let cool completely, then pat dry and flak with fork. In a large bowl combine cod, egg, scallion, mayo, lemon juice, mustard, breadcrumbs, parsley, tobasco, salt and pepper. Mix until combined. *Add a pinch of cayenne for a little extra spice. Form mixture into patties. 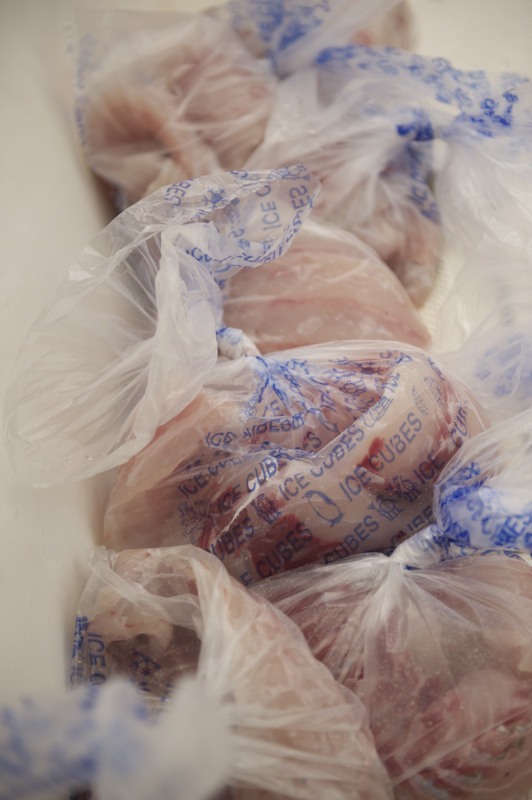 Wrap each individually and store in freezer bags. To serve immediately, heat remaining olive oil over medium heat and cool through, for about 2 minutes per side. Steam the potatoes in a large pot until very tender, 15 to 18 minutes. Meanwhile, in a small bowl, whisk together the lemon juice, thyme, crushed red pepper, 2 tablespoons of the oil, and ¼ teaspoon salt. Heat 1 tablespoon of the remaining oil in a large nonstick skillet over medium-high heat. 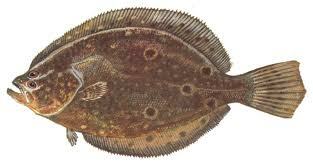 Season the halibut with ½ teaspoon salt and ¼ teaspoon black pepper. Cook until opaque throughout, 3 to 5 minutes per side. Heat the remaining tablespoon of oil in a separate large skillet over medium-high heat. Add the shallot and cook, tossing occasionally, until tender, 2 to 4 minutes. To the skillet, add as much kale as will fit and ¼ cup water and cook, tossing frequently and adding more kale when there is room, until tender, 6 to 8 minutes. Season with ¼ teaspoon each salt and black pepper. 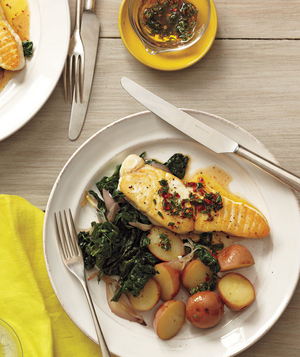 Serve the halibut with the potatoes and kale. Drizzle with the lemon-thyme vinaigrette.